We would like to thank all of our submissions to the 2018 Capture the Moment photo contest. There were many great submissions from members, parents, leaders, and friends. USPC looks forward to featuring these amazing, heartfelt, funny, beautiful, spontaneous moments in future publications and on our social media platforms. Look for your photo online and in print. All photos will appear on social media in our new hashtag #fanfotofriday. Please like, comment, and share more about your special pictures. Registration for the 2019 Equine Symposium and Convention is now open. There are plenty of different registration options from the Convention Registration, to the Equine Symposium Day passes. Early bird deals on registration are available now until November 15, 2018. 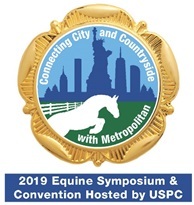 Registration includes access to the app, Equine Symposium & Convention schedule, Workshop descriptions and schedules, participation in leadership programs, Continental Breakfast and Meeting of the Corporation, ability to register for all other meal functions and more. Only planning on attending the Equine Symposium for a day? We have a registration just for that. Day passes include access to the app, workshop schedule, trade fair, and the Anatomy Room. Registration is also available on-site. See our registration page online or contact Erin Roland at activitiescoordinator@ponyclub.org for more information on the 2019 Equine Symposium and Convention. Do you like researching and experiments? Then the Research Project Fair at the 2019 Equine Symposium & Convention is place for you. Past research projects have explored a broad range of topics from different wound care strategies on healing time, to the comparison of shock absorbing qualities of different arena footing materials. This opportunity is open to Pony Club members of all ages and certification levels. To enter and learn more about this exciting opportunity, check out our online application. Western Program - What is it? The USPC Annual Fund is just one piece of the entire funding puzzle that keeps the organization running. The Annual Fund fills the gap between what member dues cover and what it actually costs to service a member for one year. Please show support of your organization by making a contribution to the 2018 USPC Annual Fund. What does the Annual Fund support? While the percentage can vary greatly for each program or activity, the Annual Fund in part contributes to: all instructional materials, rulebooks, standards, lesson plans; leadership training for members and volunteers; National Youth Congress and Academy of Achievement; National Youth Board; educational outreach; website; database; compliance; competitions; online education, webinars, communications and social media; marketing materials for clubs and centers; technical support from the national office; college scholarships for members; awards and recognition; special event organization; international exchanges; publications; club and center formation; insurance and more. All of these and more are staff supported and impact the overall Pony Club experience for members and volunteers at the club, center and regional levels. Please make your donation to the 2018 USPC Annual Fund today.